Rescue workers search mobile homes in Lady Lake, Florida. As we pulled into the Lady Lake mobile home park in Florida, the first thing we notice is sheet metal hanging from trees. Some of the park's mobile homes were lifted right off their concrete pads and tossed more than 400 yards away, their metal exteriors catching in trees along the way. Gene Barthauer, 86, was in bed last night when he heard the horrific winds whipping past. The next thing he knew his house was ripped apart. He waited beneath the rubble for nearly 20 minutes before neighbors came with flashlights. Now, Gene and his neighbors use crowbars and hammers trying to dig down to his closet. He has no insurance -- it was cancelled last year. All he wants is to find the jacket his daughter Lynne gave him -- a Michigan jacket. Across the street is a stark reminder of how lucky he is to even have some rubble to pick through. The only thing left of the home across the street is a sofa and the bare concrete pad on which it stands. The elderly woman who lived there was killed. Her body was found with much of her mobile home in an adjacent field. For Gene, life in Florida is over. He says he is going to move north to live with his daughter. About an hour after we arrive, there are cheers -- Gene found his beloved jacket. A classic El Nino event occurred in Central Florida overnight. It was a devastating event for some in Lake, Sumter and Volusia counties. Around 3 a.m., a rotating thunderstorm developed in northern Sumter County. It was strong enough to drop a tornado in the southern part of The Villages retirement community. The storm continued across the town of Lady Lake and ended many miles later in Deland. Damage appeared to be caused by an F2 tornado which would classify it at 120 mph to 150 mph. The National Weather Service will survey the damage and make its assessment. Judging by aerial pictures and reports from the ground, many homes were completely flattened. How so many people survived will make stories for week to come. This storm track, though, was personal for me. My parents live about 5 miles from the devastated neighborhoods. At 5 a.m., I called my mom to ask if she was OK. Her answer, "Why?" She didn't even know about the damage that had occurred so close to her home. Most of Central Florida does not have tornado sirens. At daybreak, I asked her and my dad to drive around and check for damage. They were stunned by what they saw -- lives torn apart only a few miles away. Reporting on this devastation took on a new importance. So many times, as a reporter, you just describe the damage and how it occurred. But this storm was different. I receive a call at home from CNN's southeast bureau chief. She tells me about the tornadoes in central Florida, and asks me to book myself on a 10 a.m. flight to Orlando with CNN Weather Anchor Rob Marciano. I'm a field producer, and Marciano and I have covered countless hurricanes, floods, snowstorms and other severe weather events. I've been through Katrina, Wilma and other storms, and have seen entire communities flattened. So I have an idea of what to expect today, and it's going to be a heart-breaking assignment. An unknown number of people in Lake County, Florida, were killed. It's horrible, and hopefully our coverage today will inspire our audience to reach out and help those in need. I shower, dress and pack lightly. My wife loads our toddler in the car, and whisks me off to the Atlanta airport. We're on the ground in Orlando, entering coordinates into the GPS for Lady Lake, Florida. I'm in the back seat, Marciano is riding shotgun, and site manager Tristan is driving. Our camera crew, with 18 cases of gear loaded into an SUV, is in tow. We're an hour from Lady Lake. Awful reports on local radio -- 14 deaths reported, and we fear the toll will grow higher. Lake County was hit hardest. The radio host is interviewing callers who braved the storm last night. Florida's governor is en route as well. He has declared a state of emergency. Our satellite truck is in Lady Lake. I will drop off Rob to do liveshots, and then take the crew to shoot search and rescue operations. Tornado watches went out yesterday. Getting the call this morning that a tornado likely touched down in Florida wasn't surprising, but the strength and damage reports that have been coming in are disturbing. Tornadoes that strike at night are the most dangerous, especially if they hit at 3 a.m., when people are sleeping. We haven't seen much with the rush to the airport. Getting on the plane, we knew at least one person had died. Getting off in Orlando, we found out 14 were killed and that that number might grow. We're driving north now toward the demolished neighborhoods. Not sure what to expect. Need to make some calls. Get some info. We go live on air as soon as we get there. Gotta go. There's been a lot of news this week about the alleged role Iran has played in the ongoing violence in Iraq. Click on the image above to hear CNN Correspondent Michael Ware's take on how, nearly four years into the war, Iran is not only involved, but has been a major factor since the very beginning. Ware has been reporting from Iraq since the war began in 2003. What started as a war between Coalition and Iraqi forces, according to Michael, has turned into four separate wars: the war with insurgents, the war with al Qaeda, the civil war between Sunni and Shia and this fourth war with Iran. Michael was in New York last week and sat down with Anderson to discuss the various wars being waged in Iraq. The clip above is taken from this conversation. We're airing the entire hour-long interview tonight, and it's truly the most raw, sobering and frankly scary discussion I've heard on the Iraq war. Biden's comment on Obama: Racist or not? We just had our afternoon production meeting and there was a lot of talk about what Senator Joe Biden said about Senator Barack Obama. Some of the staff think he was out of line. Some feel he said nothing wrong. Several bloggers believe his remarks may have been racist. We're not sure whether to add this story to our show tonight. What's your opinion about Biden's statement? Let us know. Esther Reed, an alleged con artist, may have been spotted in a northern California restaurant. The story about Esther Reed, an alleged con artist, really is a strange one. It's strange, not just because so many of the details are bizarre, but also because her motives are so mysterious. Reed, who was born in Montana, had officially been missing for about seven years. But this summer, police in New York City came across her. The catch is they didn't know it was her at the time. Esther allegedly had stolen another woman's identity. She used the identity to get accepted at Columbia and Harvard Universities, despite the fact she herself was a high school dropout. Esther apparently got her GED and took the SAT on her own, and did so well, she was admitted to both schools. CNN's Michael Ware has been covering the war in Iraq since it began, and has watched Baghdad spin out of control. In September 2004, on Baghdad's Haifa Street, U.S. troops were battling supporters of Abu Musab al-Zarqawi, the former leader of al Qaeda in Iraq. Zarqawi's fighers captured a Bradley fighting vehicle during the battle. When Michael heard that al Qaeda in Iraq had claimed the area as its own -- even plastering its banners on the street -- he went there to see for himself -- and that's when he was caught by al Qaeda fighters. Michael was in New York last week, and Anderson talked to him about that terrifying day. Their full conversation about events in Iraq airs tonight. I'm the early writer this week. It's my job to be in the newsroom at 11 a.m. for the "senior" call. That's when executive producer David Doss and the senior staff discuss what stories we're working on for the show. It's a preliminary rundown and always subject to change, but it's a good jumping off point. (This conversation begins on Blackberry and phone around 7 a.m. everyday, and the show is not on until 11 or 12 hours after the senior call.) My job is to offer editorial suggestions, work on early scripts and take notes and e-mail them to the rest of the writers. New ideas are always welcome. "Reading Arwa and Holmes makes me wonder: Didn't the U.S. KNOW what would happen when they kicked out Saddam? I mean seeing this now, how could people in the know NOT know that Iran would fill the power vacuum in Iraq? It seems like such a huge mistake and bad planning." Ted's note got us thinking: With centuries of sectarian hatred in Iraq, how could the White House not anticipate this would happen? Our Baghdad correspondent, Michael Ware, told Anderson recently that hundreds of thousands of Iraqi Shiites fled to Iran during Saddam Hussein's regime. When it fell, they returned, backed by Iranian forces. Michael had much more to say. We're going to air the interview tonight, breaking it up into several segments. I've got to run. David's asking me if I'm done with this blog already. Sen. Hillary Clinton, Democrat of New York. Excerpts from Anderson Cooper's interview with Sen. Hillary Clinton at the Brooke Army Medical Center today in San Antonio, Texas. ANDERSON COOPER: You said this weekend that the president is responsible to extricate the United States (from Iraq). You said it would be irresponsible not to. Do you mean U.S. troops pulled out of Iraq by the time the next administration comes to power? SEN. HILLARY CLINTON: ...This was his war. He conceived it poorly. He executed it incompetently. He's pursuing a strategy that's more of the same. I see no change in direction. And that's what I've been calling for. I want to begin a phased redeployment of our troops. I think there are still vital national interests in Iraq, particularly in Al Anbar Province, where we're fighting insurgents, particularly against Iran trying to extend its influence, particularly in the north. We have to work with Kurds to make sure they're able to continue building a better future. I just don't see that the present strategy is working or workable. I really don't understand how he's just so willing to pass this on without understanding what needs to be done to change direction to whoever comes after him. COOPER: Extricate ... you think they should be out? CLINTON: You know, it's problematic to set a deadline. I'd like to see a process. I'd like to see a strategy that is moving toward us beginning to move our troops, as I've called for over a year-and-a-half. COOPER: You called for a cap. Obama [called for a cap]. Critics say if you believe there haven't been enough heretofore, what does capping do? CLINTON: Well, cap is meant to send a signal, as is our effort to get a resolution of disapproval that he no longer has political support in the country or the congress for pursuing this policy. The cap is to literally cap the number of troops so that we can begin redeploying them out of Iraq. And we've got to start somewhere. And this gives us a way of making the argument that this president shouldn't be adding troops. He should begin subtracting troops. Now I'm a realist, and I know that we're still fighting to get just the resolution of disapproval through the congress on a bipartisan basis, but I think it's important to start laying down these markers and send this signal to the White House, to this president and this vice president. COOPER: This center cost $50 million. American citizens, some giving a dollar here, others large donation, have given a lot. It says a lot about the American people. What does it say about the government? CLINTON: That's a really good question, Anderson. Obviously, we're unique in America because we have the partnership between our government and our citizens unlike anyone anywhere in the world. And we do meet needs that are not gonna be met. But this doesn't relieve the government responsibility for doing everything we can to fund the VA, to make sure every VA in the country is ready to prepare a welcome with the services that are necessary. So one of the reasons that I fight to get VA funding is because that is national obligation. But what the Fisher family and 600,000 donors decided to do was to speed the process. Unfortunately it takes a long time to get things done in our govt. COOPER: Money has been earmarked for Walter Reed facility that hasn't been built. CLINTON: In fact, there's even talk about closing Walter Reed. So we don't have facilities in place to deal with more than nearly now 23,000 wounded coming out of these conflicts. This is a great facility, where we are right now, the Fisher houses are really a truly private philanthropy that is to set up these living quarters so that families can come and be near their loved ones when they're recuperating. I've met a lot of families who've been living in Fisher houses for a year, year-and-a-half, because it takes that long. So we have this partnership, but that doesn't mean we should let government off the hook. COOPER: We're not ready to meet the needs of our servicemen and women? 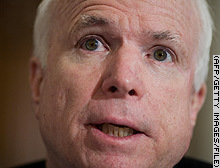 Sen. John McCain, Arizona Republican. Excerpts from Anderson Cooper's interview with Sen. John McCain at the Brooke Army Medical Center today in San Antonio, Texas. ANDERSON COOPER: Some argue ... If the United States is taken out of the equation, it's a Sunni-Shia war basically ... The war happens and it happens and at least the United States is not the central focus of it. COOPER: You think full-on genocide is possible? MCCAIN: Of course. Of course, I think there would be ethnic cleansing on a massive scale. But as importantly, when you see Iranians asserting their influence in the region, which is already significant. When you see Sunnis, particularly Saudi Arabia, feeling they have to do something to protect the Sunni, when you see uh, Turkey becoming more and more nervous about what happens with Kurds, you have a very volatile situation. And not to mention the Syrian involvement as well. So, the scenario is not good. There are no good options. COOPER: Any scenario where withdrawing is acceptable to you? Or re-deploying? MCCAIN: Not until we have a situation under control to the degree the Iraqi government can exert its influence through most of country that you start, you move forward with a political and economic process. That's what the goal is. COOPER: Success is crucial before the United States can pull out? MCCAIN: That's my view, and that view, by the way, is held by the majority of experts I know about the region. Now, if you want to pull out, set a date, one week, five months, six months, whatever it is. Then I think you have the obligation to say what happens when we leave. We hear all the talk about leaving. ...But I'd respect it more if they said, and then, what's going to happen. Everything will be quiet and peaceful? I don't think so. And I think that again, our national interest, our vital national security interest, resides in the Middle East certainly at this time. COOPER: Sen. Clinton is proposing cap on troop levels at the January 1 level; Obama says January 10. Does that make any sense to you? MCCAIN: First of all, I think I'm fairly well versed in military matters and tactics and strategy. I've been involved in it literally all my life in one way or another, but I can't tell you how many troops are needed. I think it's pretty clear the number of troops we have isn't getting the job done. I think there's almost universal acceptance of that. So you put a cap on it? So the status quo remains? Which is a steadily deteriorating situation? Again, intel sources tell me, by the way, public not classified, that if this present situation continues, within six months you'd see absolute chaos in Iraq. So cap on troops? There's a certain lack of logic associated with that position. But I respect it. And I think we need respectful dialogue and debate on this issue. COOPER: Do you think the full cost of this war is really known in terms of what it's don to young people -- lost limbs, PTSD? MCCAIN: Probably not, because good news is that our ability to save lives is enormous, and yet it leaves us obviously with many, many people who are injured permanently. But again, when you look at some of the state-of-the-art artificial limbs, it's pretty remarkable. And they're able to do many things that even a few short years ago they weren't able to. And the indominable spirit is incredible. COOPER: This center was built with private funds. This Fisher House we are in was built with private funds. Why isn't the government doing this? MCCAIN: I think we probably should get into that. I do think that it's a partnership. Once these facilities are built, such as rehab center, then the military takes over. It is a partnership. It's federal law, etc. But probably we should do more and the Fisher family is probably an example to all of us. But i also would point out, it's nice to see this symbol of generosity. Thousands and thousands of americans donated to this facility. That's a sign of support. No matter how people feel about the conflict, it's clear how they feel about the men and women who are serving. COOPER: A lot of our leadership says our veterans are important -- they deserve the best treatment possible. Yet it took a private organization to build this. Why hasn't the government spent $50 million on a center like this? MCCAIN: In reality, we are spending billions, and we should for the care of our injured and veterans. I'm proud of many of the veteran facilities that we have. Can we do more? Always do more. Because the reality is we can never do enough for people who have served and sacrificed in this fashion. What would you ask McCain, Clinton? A new rehabilitation institution at the Brooke Army Medical Center in San Antonio, Texas. With all of the debate over sending more troops to Iraq and Afghanistan, we were glad to hear about a new institution built on both hope and private donations to help some of the U.S. service men and women wounded in war. So far, more than 20,000 U.S. troops have been injured -- some horribly burned -- and more than 500 have lost a limb, according to the Associated Press. These are America's fallen heroes. So tonight, Anderson will broadcast live from San Antonio, Texas, at the Brooke Army Medical Center for the opening of a state-of-the-art military rehabilitation facility, The Center for the Intrepid. The center will treat America's most severely wounded troops, including service members who have lost limbs or were severely burned. A number of dignitaries are there today, including two presidential candidates: Senators John McCain and Hillary Rodham Clinton. Both are speaking at the ceremony and both are sitting down for interviews with Anderson. Anderson will also give us a tour of the new rehabilitation center and speak with the doctor in charge of the operation. He will also talk to soldiers receiving care. We'll also try to find out why the $50 million raised to build the center and the adjoining Fisher Houses (places for families to stay while they attend their loved ones during their rehabilitation) came entirely from private donations. Not a dime was paid by the government. Why is it that this state-of-the-art center for injured troops had to be funded privately? As for Senators McCain and Clinton, both are sharply critical of President Bush's policy in the war in Iraq (she said it has been executed "incompetently"; he said it was a "train wreck"). What would you ask them? Let us know in the comments section below.